Among our initial cohort of innovation clusters, a network of pilot sites in the state of Washington represents the leading edge. This collaboration includes five program sites linked to six university-based researchers and a working group of program directors, managers, and senior advisors across multiple state agencies. Central to the success of our innovation approach to testing new ideas and interventions is the idea of fast-cycle learning – that is, evaluating the work as it progresses, discovering quickly what is working for whom and not working for others, and making rapid adjustments based on those assessments. This ongoing interaction between researcher and program site is very different from most community-based studies. Read more about the Washington Cluster in the September/October 2017 issue of Child Development. Guided by a process committed to breakthrough outcomes for the most disadvantaged children, our Washington cluster is implementing several pilot projects that demonstrate fast-cycle learning in action. Featured projects include FIND and Learning Through Play. 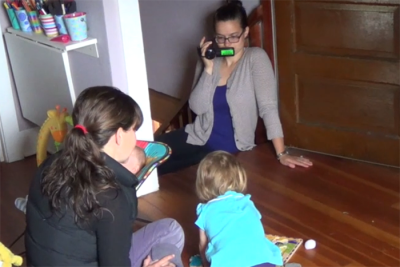 Filming Interactions to Nurture Development (FIND) is a video coaching program that aims to strengthen positive interactions between caregivers and children. Learning Through Play utilizes games and play coaching to improve executive function skills in children.